Following our look at the Asics Gel Lyte 3 “Red October," another snakeskin based Gel Lyte 3 has hit retailers as well. 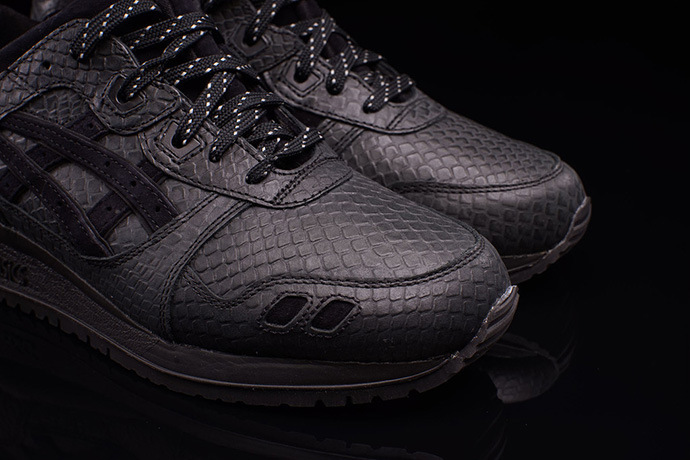 Coming up next is the Asics Gel Lyte 3 “Black Mamba." The sneaker is another monochromatic beauty from Asics, and you don't want to sleep on these bad boys. The Asics Gel Lyte 3 “Black Mamba” is fully decked out in a black snakeskin textured leather with matching accents throughout. Complete with suede finishes, the overall appearance on the sneaker is amazing. Available soon at select Asics retailers like, Oneness, you can grab the Asics Gel Lyte 3 “Black Mamba” for $130.